From the moment we are born, we become the most important thing to our mothers. We create a sense of worry for them that will never cease and yet provide joy & strength at the same time allowing them to multitask to a level of unbelievability. When we stop and think about it, honoring our mothers once a year seems so little a gesture. What I mean is that a mother loves & tends to her children 24/7, and all they get for recognition is a nationally acknowledged day for them. While this is all fine & dandy, it behooves us as children to reciprocate our mothers' actions toward us. And the truth of it all is that the smallest of gestures affect our moms the most. A simple kiss and "I love you mommy" goes a long way. It's like giving them a vitamin B12 shot and they are off to the races. The problem is that we take our mothers for granted without realizing it. They do so much for us when we are children, we grow accustomed to their doting ways. As we become adults, it sometimes slips past us that our mothers have done so much and we don't even as much recognize this fact. And yet, our mothers look at us with beaming eyes and an ever willing stance that can only be understood as "always on call". Well this post is to remind everyone that mothers have been known to do amazing things and raising a child is no joke. I wish to salute all mothers for what they do and put up with on a daily basis. My mothers always said that "a mother can take care of 100 kids, but 100 kids cannot take care of one mother". There is a certain truth to this. That is why I strive to do my best because that is what I should do as a person and also to not make my mothers efforts and sacrifice be in vain. For this whole month, check this blog for all things "mommy". 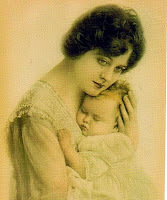 From anecdotes to recipes to videos and articles from other writers about mothers. They will be informative, enlightening, funny, profound, and just nice to check out. And please share with us. Our moms always brag about us kids, let's return the favor. Here is a beautiful music video from Il Divo... I love you Mom.